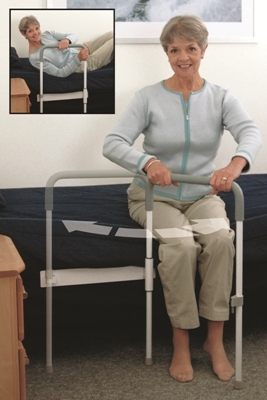 Provides assistance with getting into and out of bed, in bed positioning, and standing. Fits twin to king size beds. Easy To Install. Simply slide the support frame between box spring and mattress, and secure with the safety strap. Ideal Support. Unlike fixed bedrails, the Smart-Rail™ unlocks and swings open to provide improved standing support at bedside. Well placed support can help to reduce the risk of fall related injuries by eliminating the need to reach and twist. Independence. With secure, reliable support placed exactly where needed, there is less help required by a caregiver. Encourages confidence and independence. Optional Leg Extenders: Increase standard rail height 31.5"/80cm up to 34.5"/88cm.